Amateur courses planned at home for grown-ups and kids. "School holidays" for foreigners, a week in Lazio's countryside full of trips, visits to farms, walks in nature and, of course, Italian cooking lessons with tasting of food and wine. What are those gourmand meetings? meetings are a return to childhood when we played "mothers" with our girlfriends, preparing din-dins for dolls or dinner for the husband; or when, with mom or granny, we cooked tarts or sponge cakes. You choose a theme for the lesson (see list), some friends (minimum 2, maximum 4) and a kitchen (between yours). I'll come with the shopping and the necessary equipment. If you believe it, you can take advantage of preparing together a real meal, from appetizer to dessert; at the end of the day, you'll taste it with your husbands, obviously welcome guests. Cookery can be truly amusing and relaxing. Think of a weekend in Lazio's countryside, immersed in beauty and green. Think of spending time between trips in farms and..cooking lessons with final tasting. Lezioni di cucina amatoriale per grandi, giovani e piccini in lingua inglese o italiana. Un modo diverso di imparare a preparare piatti della tradizione mediterranea apprendendo, perché no, anche un pò d'italiano. 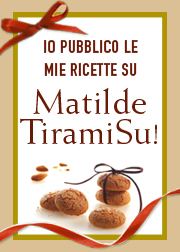 imparare a fare dolci, al cucchiaio freddi o caldi, o torte sontuose. Ma anche preparare una cena completa, dall'antipasto al dolce, in 2 ore. I corsi si svolgono ad Anguilara Sabazia e sono pensati per minimo 4 massimo 6 partecipanti. A richiesta il corso può essere svolto nel vostro domicilio: baserà formare un gruppo di amiche per passare qualche ora insieme in modo diverso, divertente e costruttivo! Corsi per stranieri in lingua inglese.